SCOTTSDALE, Ariz. – March 26, 2018 – Barrett-Jackson, The World’s Greatest Collector Car Auctions®, will accelerate its “Driven Hearts” campaign, the company’s first-ever yearlong charity initiative to help raise funds and bring awareness to heart disease and stroke, during the 2018 Palm Beach Auction, April 12-15 at the South Florida Fairgrounds. 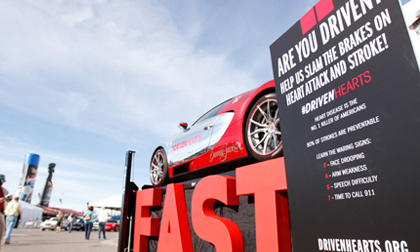 The charitable initiative, spearheaded by Barrett-Jackson’s Vice President of Brand Strategy, Carolyn Jackson, was unveiled during January’s Scottsdale Auction and benefits the American Heart Association. The electrifying and incredibly moving sale of Carolyn and Craig Jackson’s Driven Hearts Corvette was not just an inspiration to those inside the auction arena. Darrell and Charmaigne Pullen, who watched the sale on TV from Texas, flew to Arizona following the auction and personally donated their matching 35th Anniversary Corvette to be auctioned in support of the Driven Hearts campaign and the AHA. The matching Corvettes will be staged together in Palm Beach and the Jackson’s Corvette, which was donated back to Barrett-Jackson not once, but twice, will be auctioned again during the 16th annual event, while the Corvette donated by the Pullens will be auctioned later this year. Additional elements of the Driven Hearts campaign that will be seen in Palm Beach include Craig Jackson’s wrapped 2008 Bugatti Veyron in a stunning red and silver #DrivenHearts livery. A fan-favorite photo opportunity in Scottsdale, the vehicle will again be on display to help promote the cause. Signage around the venue will again be seen promoting FAST, the AHA’s acronym for Facial drooping, Arm tingling, Speech impairment, Time to call 911. Barrett-Jackson also has released the second of four commemorative collector plates to debut at the Palm Beach event. The new plate, featuring the letters “DRIVEN,” will be on all auction cars and is available to purchase on-site and online at ShopBarrettJackson.com for $10, with $5 benefiting the AHA. The last two collector plates will be released in advance of the Northeast and Las Vegas auctions. Additional details and information on the campaign can be found at drivenhearts.org. The Vehicle Docket for the 2018 Palm Beach Auction, April 12-15 at the South Florida Fairgrounds, along with additional event details, are now available at Barrett-Jackson.com. For more information on becoming a bidder for the 2018 Palm Beach Auction, including the John Staluppi Cars of Dreams Collection and the South Florida Collection, follow the link to www.Barrett-Jackson.com/bid. To submit an application to consign at the 2018 Palm Beach Auction, click here.